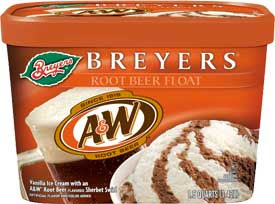 UPDATE - June 2009 - Breyer's A&W Root Beer Float has been discontinued. I hate to say it, but I knew this was a mistake from the very first taste. I like root beer (though it's been awhile), and I love ice cream, but this just doesn't work for me. You're probably asking why I bothered buying it in the first place. I was trying to be open minded when I picked this up, but I just can't get over that soda feel to the whole thing. Yes, I should have expected it, that's the whole point of this flavor. I just expected something more mellow I guess. Wow, am I making any sense whatsoever? I actually tried to cover up the flavor with Nesquik, but it wasn't strong enough. I tried to add some more Nesquik, and a hint of strawberry, but that was even worse. Ya know, it almost had a coffee flavor to it after that. Yeah, into the sink it goes. Sorry. I'm sure this is good to float lovers, but it's just not for me. Hmm...haven't heard of this flavor yet! Sounds interesting! It was a good idea - since ice cream floats are good - but as an actual ice cream flavor...I don't know. I'd love to try it - but I don't think it'd be my favorite! I just asked and found out this product has been discontinued. Sorry! try edy's "root beer float" this summer. Best ice cream ever it's been 8 years and I still catch myself looking for it hoping I would find it.